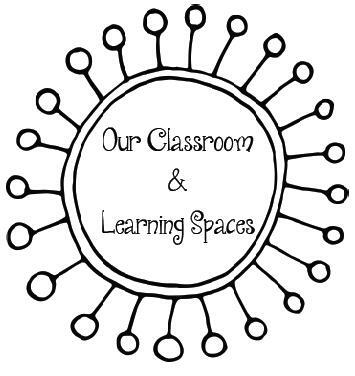 Welcome to our classroom! 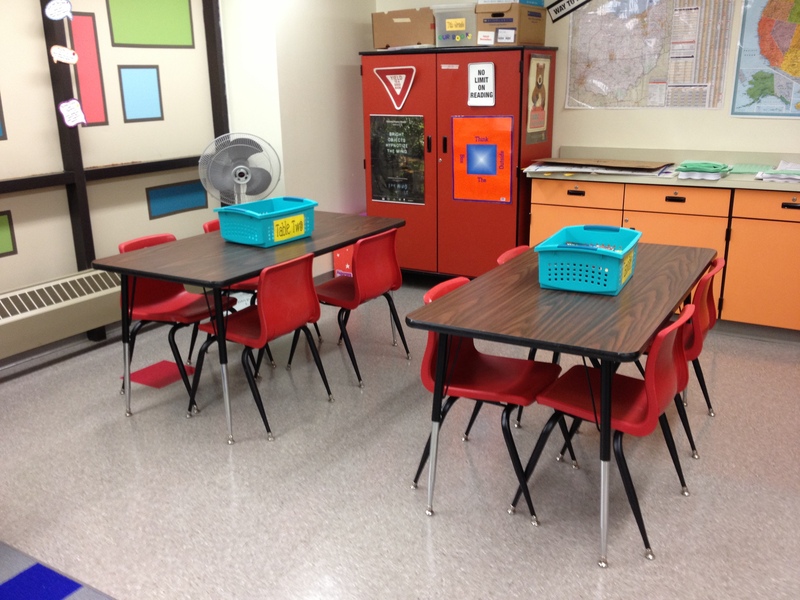 I love having tables in this space so students can easily turn and talk and work in groups. To the left you can see our exit slip wall, which we use on a pretty regular basis. Here’s a look from the back to the front of the room. I have bins on every table to house folders which we use every day. I used Modpodge to cover the bins with the pictures of the covers of books I read last year. Free advertising for our library! My space of the room – computer, desk, and personal bookshelf. Notice my signed copy of Fortune Wookie in the corner with a picture of Tom Angleberger and I when he was in town last year. So proud of this! 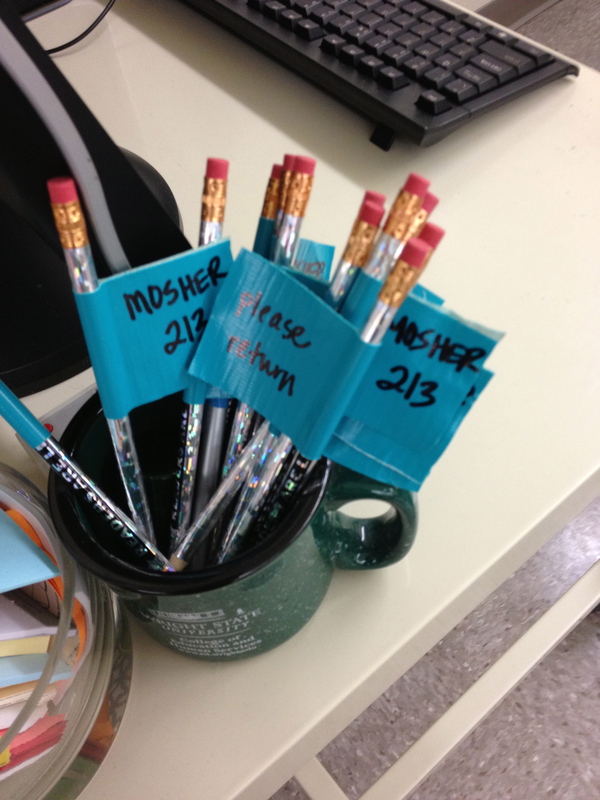 Trying something new this year with my pencils… School pencils are like socks. They go missing all the time! 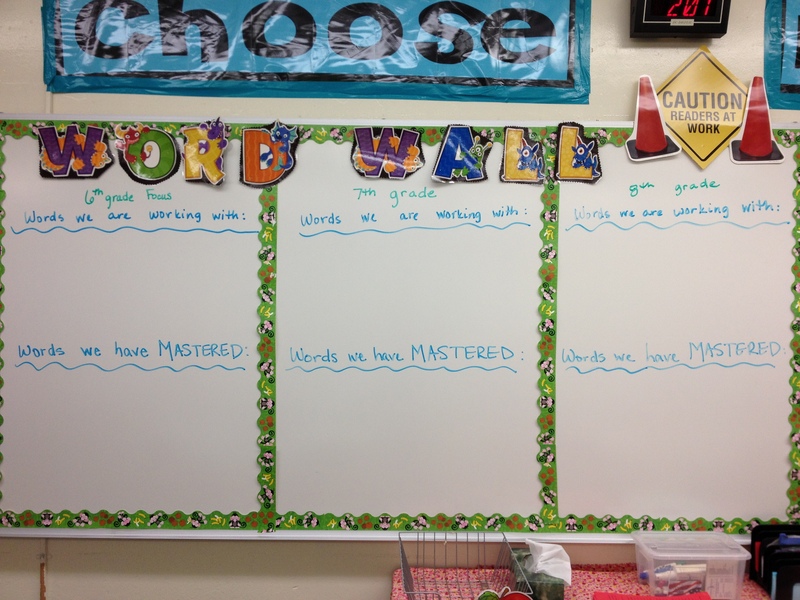 These two pictures are of our Word Wall & Agenda Board. 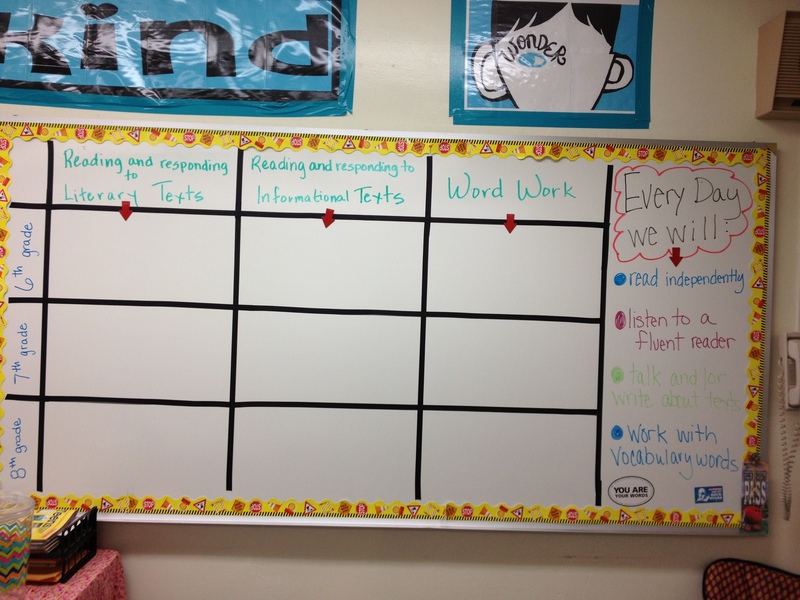 I teach separate classes for sixth, seventh and eighth graders, so I try to keep everything organized. I post our daily “I can statements” on the agenda board right next to our daily goals. I made this Choose Kind poster last year. My number one classroom expectation is “Choose Kind”. 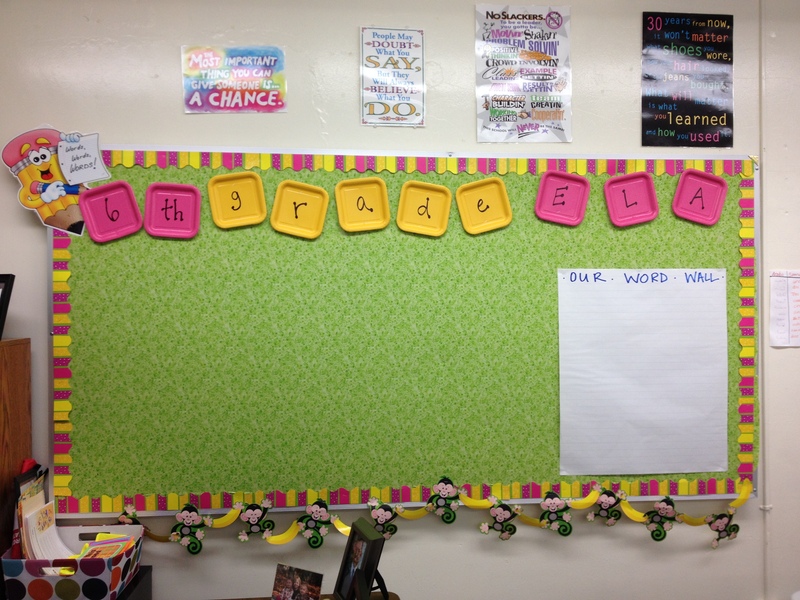 Two more boards – one for the sixth grade gifted ELA class I will be doing some work with this year for my Gifted Endorsement, where we will start the year by posting our favorite quotes from Wonder and our vocabulary words. 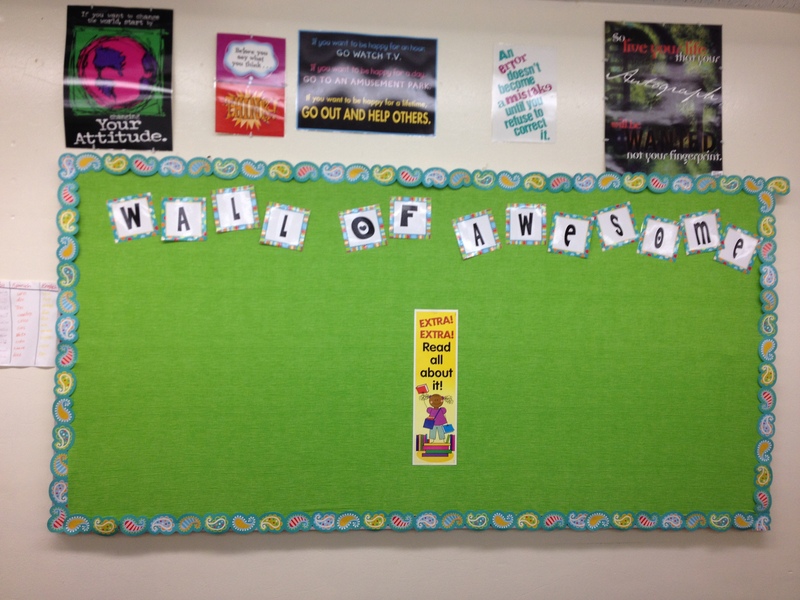 Our Wall of Awesome is a space where I give students some ownership and we post quotes from books, student work, and pictures from student events. 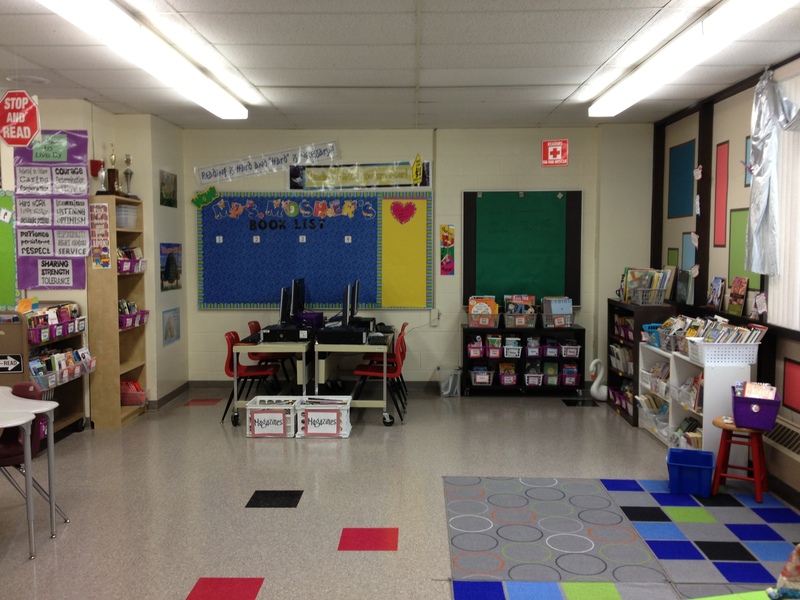 Here’s the back of our room where we have our classroom library and computers. Here’s a better view of the library. 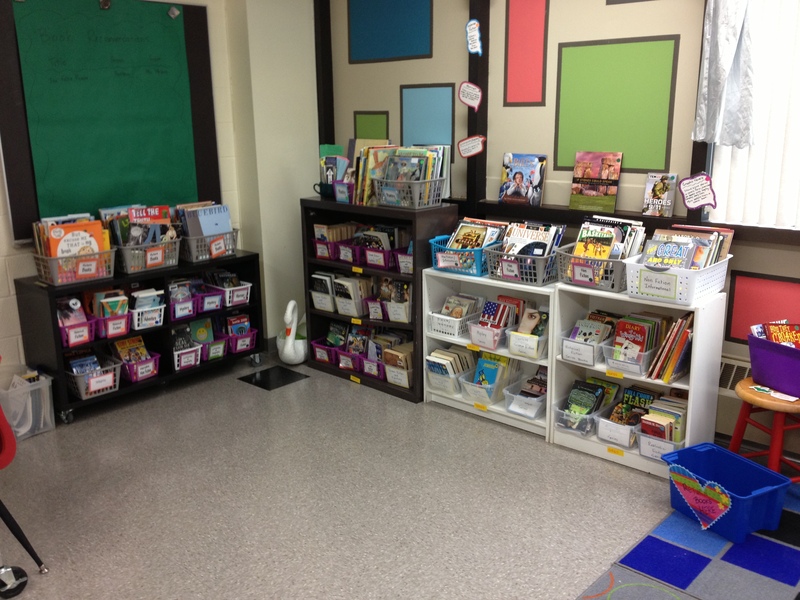 Books are organized by genre and put into baskets. This year I made a special section for books that are part of a series, and these are the majority of the baskets. 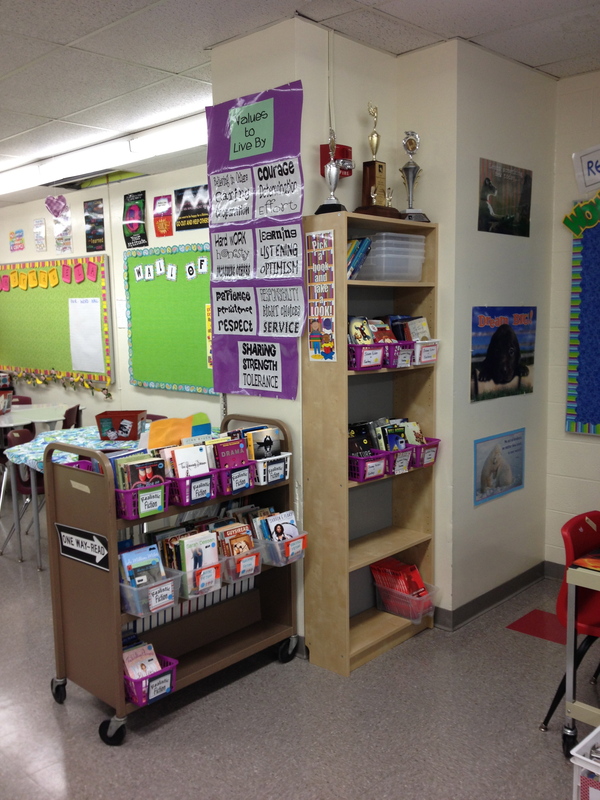 The green paper hanging up is for students to make peer book recommendations. 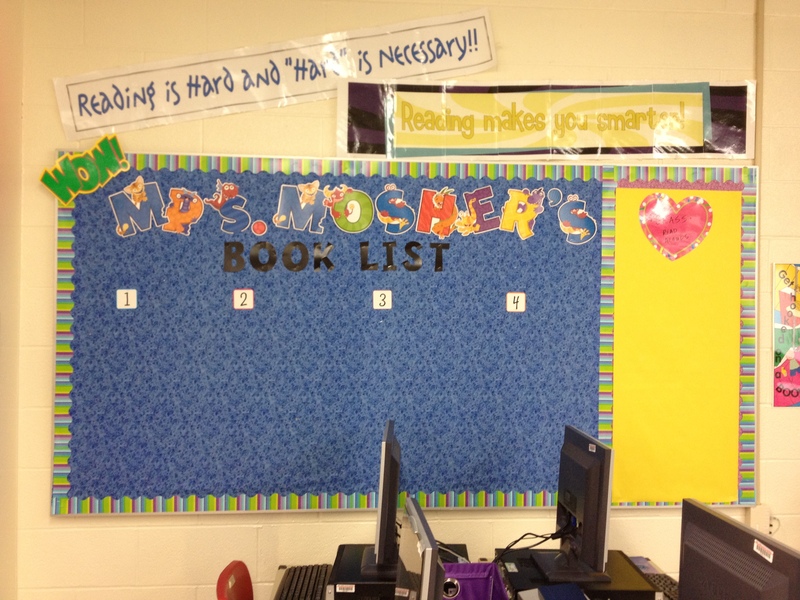 This bulletin board is where I will display what books I read during the school year and where we will keep track of all of our class read alouds. 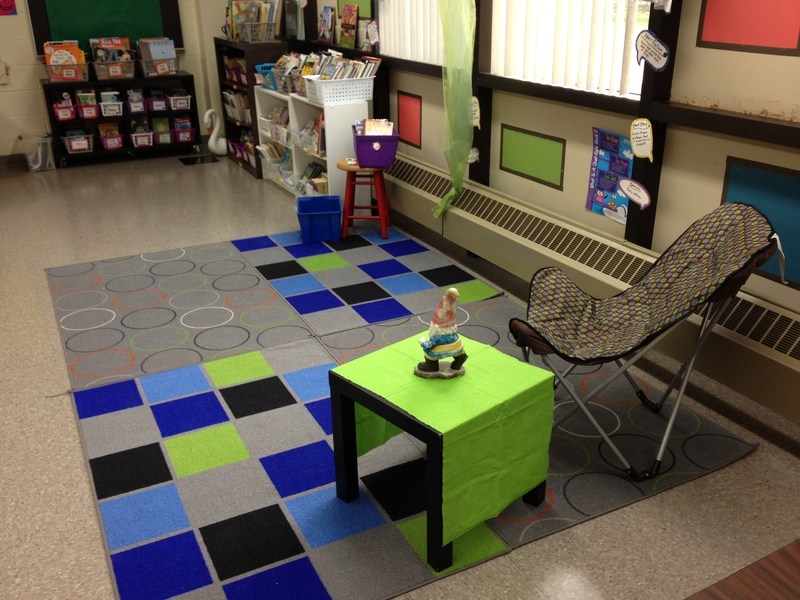 The carpet is a place for students to read. I keep a “New Books” bin and a “Return Books” bin in this spot. I also have several cushions that students can use around the room to sit on if they wish. Directly opposite from our library is another great learning space for students to work and conference with me. 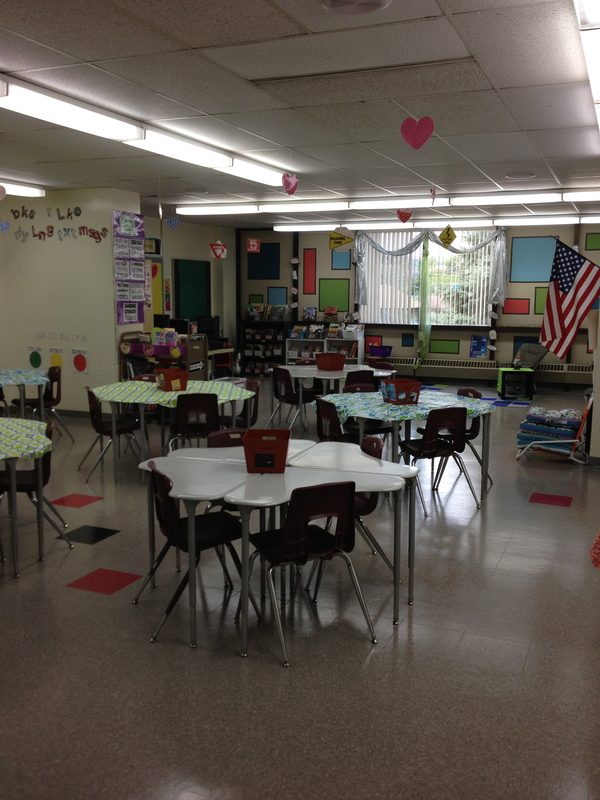 I hope you enjoyed this tour of our classroom! I am so thankful for the amount of space we have and flexibility that the tables give us so we can move around as needed. 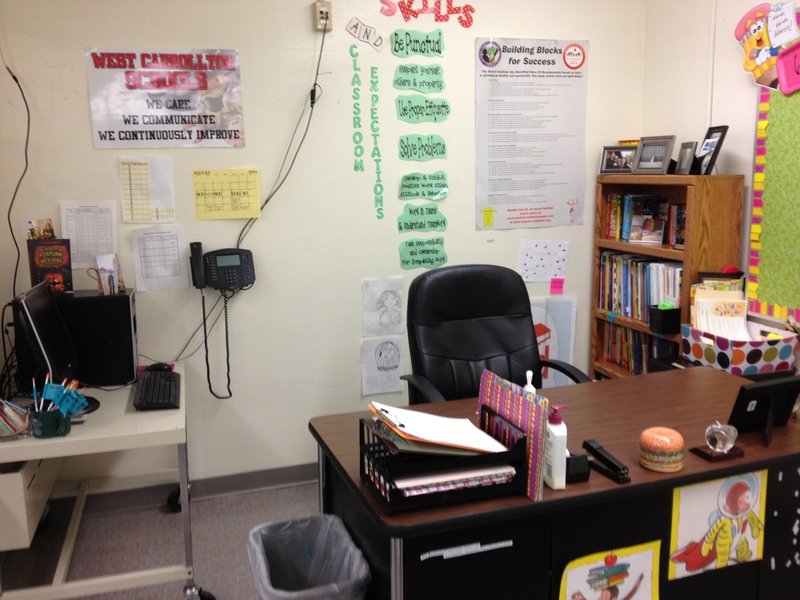 I have tried to create a welcoming space for my students and a place that I love to be in as well. 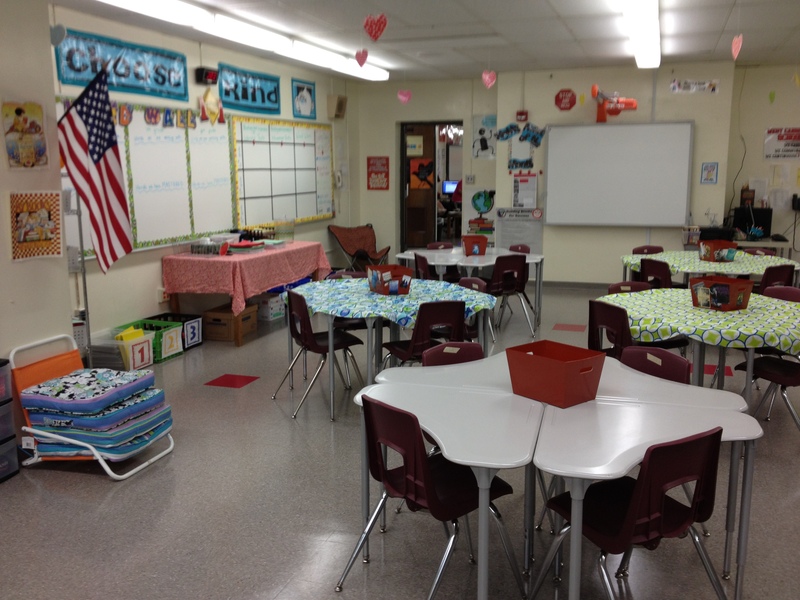 Your classroom speaks of the respect you feel for your students. Being in Rdg. Intervention could be a chore, but you make it look very appealing. Best of luck this school year! Leslie, I finally got around to looking up your website-wow! I am overwhelmed by your creativity. What a blessing to get a further insight into who you are! What child would not love to have you as a teacher? !